The past 10 days have been packed with excitement – too much for me at times. It started off with an urgent change to a new camera and laptop and I wasn’t too happy about this at first. I’m not a very technical person, I prefer sticking to a set up once it’s up and running rather than getting used to all sorts of technical novelties every couple years. I’m a bit lazy in that respect, but my forthcoming cookbook pushed me out of my comfort zone and called for new equipment. After 2 days of confusion and desperation, a long talk with my wonderful and patient photographer friend Anne Deppe, I felt ready for a new technical era in my life! So once all these issues were solved, I could finally get started with the first recipes for my book. It felt a bit intimidating in the beginning when I took the pictures. I thought “wow, this will be printed one day, I’ll be able to hold these photos in my hands next year”. No more digital flexibility, this is the unchangeable analog world, I’ll have to make final decisions together with my editor Holly which will be irreversible at one point and printed onto paper! I stopped for a few minutes, put the camera aside and took my time to process everything that happened in the past month. I looked at the camera and the sandwich on the table right in front of me and made a decision: this is going to be fun, exactly like my blog! 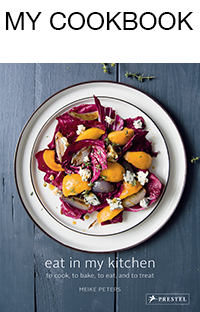 Eat in my kitchen has always been about my love for food and my enjoyment in the kitchen, I’ve enjoyed every second of this journey and I’ll keep it this way. So when this mental hurdle was overcome, the recipe craziness began: I cooked and baked 17 new dishes in the past 5 days, luckily we had family over from Malta. Everyone was more than happy to join our meals and I was very glad to hear their feedback. 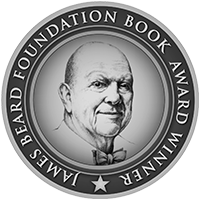 It was a very satisfying experience for both sides and there are hopefully many more to come in the next few weeks and months while I’m cooking and baking for the book. When I met my friend Anna to talk about my technical issues, I decided to make a bunch of muffins with relaxing and caressing qualities. I needed some soul food for my stressed mind. I threw in my first strawberries of the year and their subtle sweetness matched wonderfully to the smooth dough which I refined with ricotta, olive oil and orange juice. 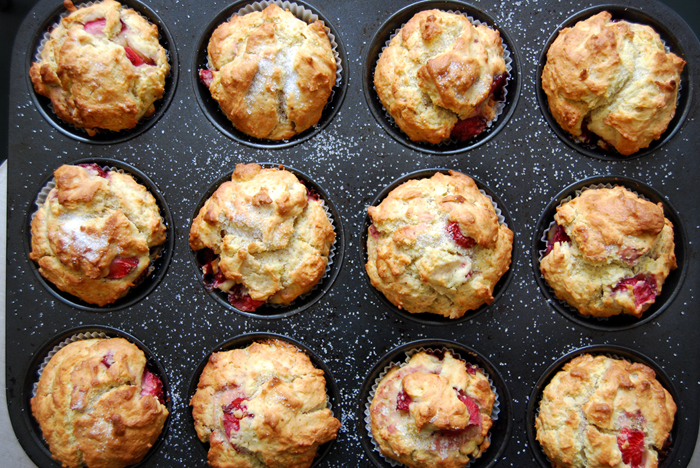 They came out as being perfect spring breakfast muffins, light and fruity – and they relaxed me! In a large bowl, combine the flour, sugar, baking powder, baking soda and salt. Take out 1 heaped tablespoon of the flour-sugar mixture and mix quickly with the strawberries. In a second bowl, mix the eggs, ricotta, olive oil and orange juice until light and fluffy and pour into the bowl with the dry mixture. Stir with a wooden spoon until you have a lumpy dough (with a bit of flour left here and there) and gently fold in the chopped strawberries. Keep in mind, the more you mix it the more it will lose its light texture. Fill the muffin tray with the dough and bake for about 18 minutes or until golden. 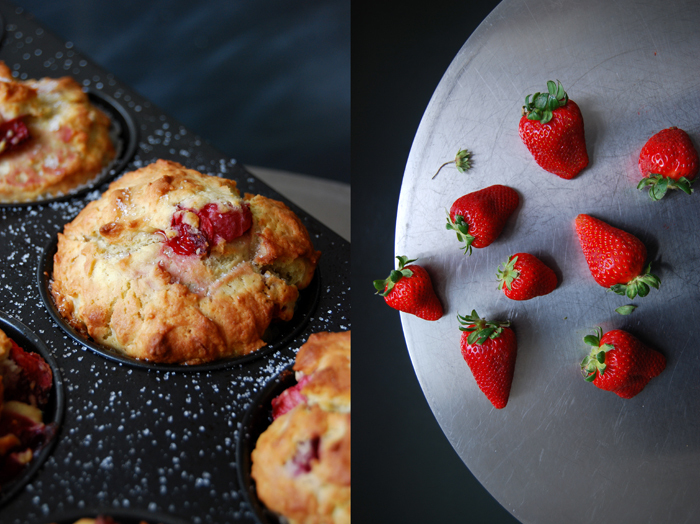 Take 1 muffin out of the tray and check with your finger if the bottom is baked through (the strawberries will make it very juicy). Sprinkle the muffins with a little sugar and let them cool on a wire rack for a few minutes before you put them on your breakfast table. herzlichen Dank für dieses wundervolle Rezept. Mein Sohn (2 1/2) und ich haben die Muffins am Wochenende gebacken und sie waren köstlich – und dementsprechend auch schnell weg… 😉 Das beste: da der Teig nicht so süß und durch das Olivenöl nicht so attraktiv ist (O-Ton mein Sohn: das schmeckt gar net läcka) bleibt tatsächlich mal das volle Rezept Teig übrig und wird nicht schon im Rohzustand verspeist ;-). Die Muffins sind gebacken dafür umso besser – fluffig und saftig! Klasse! Ich wünsche euch beiden einen sonnigen Montag! 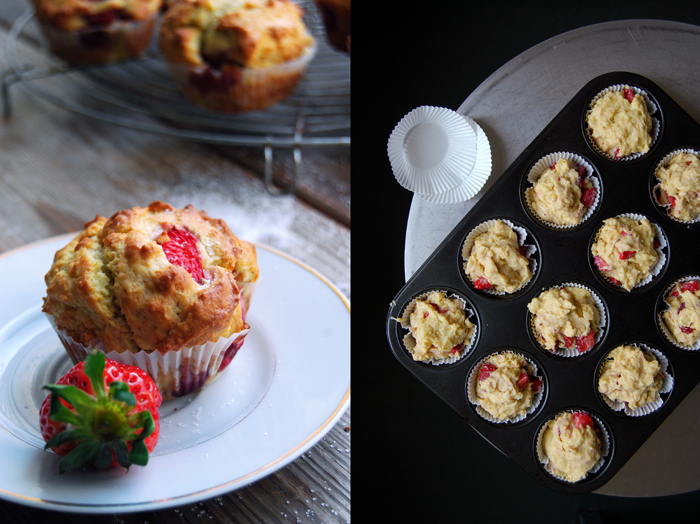 I just wanted to let you know I made the muffins this weekend and they were the most delicioous muffins I have ever tried – and so easy to make too! Thanks for sharing! I look forward to trying more of your recipes. And your recipe this time?? Looks great!! 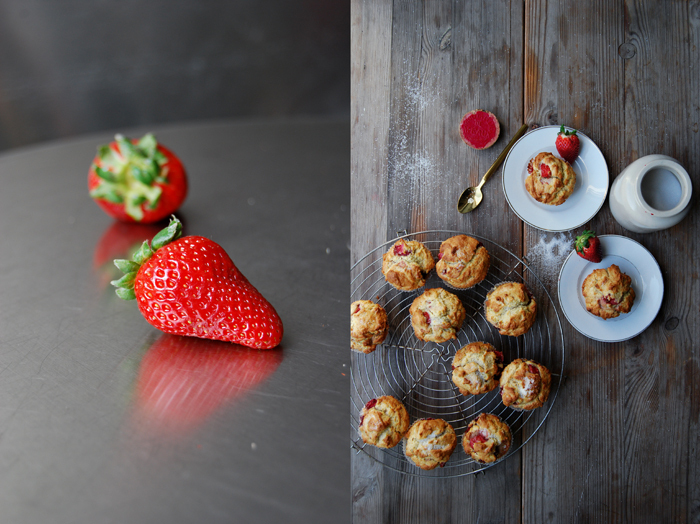 I search every spring for recipes with strawberries, beside the classic cakes and “Tortenboden”. Next time when i’m at the market i wil look for some beautiful strawberries to make this little soulfood. Have a nice and perhaps sunny sunday!